Someone recently gave me this box, containing 5 packs of 10g each of a tea that I’ve never heard of before. 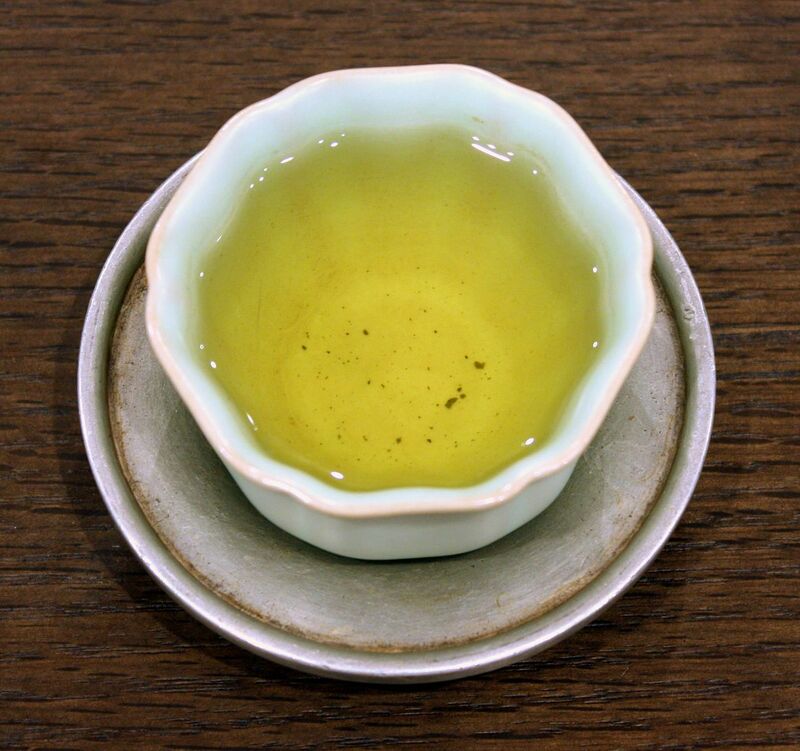 The tea is called Jibian Wulongcha, which literally means “Extreme border oolong tea”. Jibian, in this case, is a brand name, and if you look at the back of the box, you’ll find that they say the tea is made from qingxin wulong, also sometimes known as ruanzhi wulong (and misspelled as luanze, from what I can tell), but the location of production is Yunnan province of China. These are, in other words, Taiwanese tea trees transplanted in Yunnan. In fact, the little red thing next to the logo tells you it’s from Tengchong gaoshan, not too far from Gaoligongshan and other high mountains of the Southwest. Someone, probably a Taiwanese investor, has obviously got the idea of making Taiwanese oolongs in Yunnan province. The pictures’ colours are a little off – it’s difficult to get the white balance just right. However, I can tell you that it is almost impossible to distinguish this tea from any run of the mill regular Taiwanese gaoshan oolong. Certainly the leaves are slightly less rolled than the typical Taiwanese oolong these days, but right from the get go, when you open the little pack, you can smell that distinct Taiwanese oolong scent. The tea itself also tastes slightly off – something is a little different, with a bit of a spicy finish, something you don’t normally find in a Taiwanese tea. However, if I wasn’t warned that this tea is not from Taiwan, there’s basically no way I would have guessed that this is tea from Yunnan. It’s not bad, it’s just different. There has been a lot of talk in recent years about how there are farms in Vietnam, for example, that were started by Taiwanese merchants selling these teas back to Taiwan as gaoshancha. They can be quite authentic tasting, at least initially, and only reveal their true colours upon closer inspection. There’s also Zealong, which is the same thing, basically, but in New Zealand, with a really clean finish and a fairly bright taste, although at a hefty price. What this tea here does is the same, except they’re making it to probably sell to the Mainland China market. One of the things this tea shows though is that much of what you drink and taste, in terms of scent, mouthfeel, etc, are very easily manipulated and that people who know what they’re doing, with the right technology and skills, can easily replicate a tea that you think is unique to one region. While there are subtle differences that can be distinguished if you pay close attention, if this tea were sold without packaging, in loose form, in a store in Taiwan, I’d be hard pressed to say I can tell that it is not from Taiwan. This is why it is almost futile to try to identify teas based mostly on scent and taste. So much of it can be fudged that there is actually very little that one can rely on with any type of precision. It is true that it is possible, for example, to try to use those factors to help identify whether or not a tea is from a certain area or not, but when something comes out of left field, such as Yunnan tea trying to imitate Taiwan tea, it is actually quite difficult to tell what it is, and all kinds of clues can lead you astray. 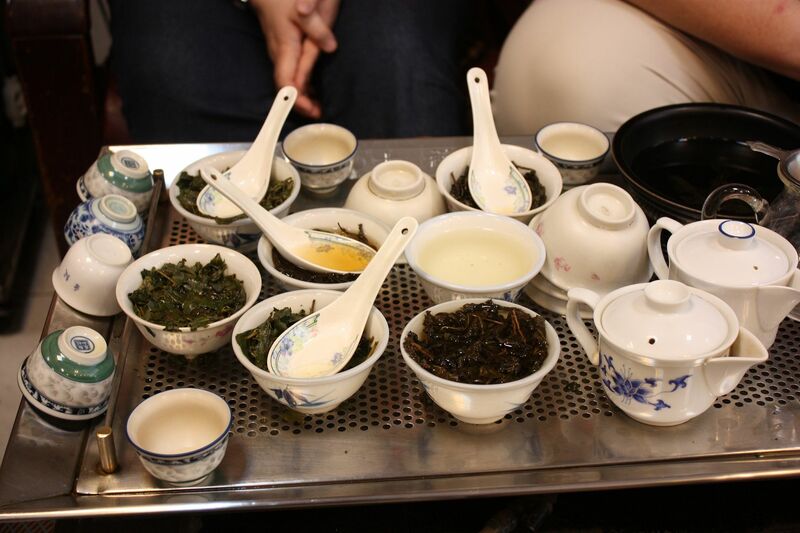 When people use teas from other areas to imitate Yiwu, for example, they are also imitating the processing techniques prevalent in the Yiwu region that give the tea there its taste and scent. The same can be said of other locales, and in this day and age, there isn’t a lot that is secret in terms of tea processing techniques, unless it’s a new invention that hasn’t been widely disseminated yet. Just because a tea is from the right area doesn’t mean it’s going to be better either. There are plenty of terrible Taiwanese oolongs out there, and many good ones too. This Tengchong area tea might still need some work, but Zealong, for example, can beat many Taiwanese oolongs out there, although not necessarily at that price. The point is, it is much more important to chase after good teas than it is to chase after good regions – the former is tangible, real, and get to the point. The latter is just a label. As we all know, never judge a book by its cover. One of the most profound changes in the drinking of teas in Southern China in the past few decades has been the gradual shift from darker, heavier roasted oolongs to lighter, more floral and less roasted teas. The former can be anything from completely carbonized, black as charcoal teas to ones that are more orange than brown. The range of colours of roasted teas can be seen in this post of mine from a little while back, when I tried three different teas with varying levels of roasting and blending. These are not representative, but at least give you a sense of what can be out there. Such roasted teas, however, are increasingly hard to find, at least ones that are done well. Farmers and vendors in mainland China tend not to carry any such teas, and when they do, they are either very expensive and sold as specialty items, or very bad, or both. Instead, most of the time you find oolongs that are completely unroasted, that are somewhere between lime green and nuclear green in colour, either dry or brewed, and which are extremely fragrant. Some are so “fresh” they need to be kept in fridges, which makes you wonder what people used to do before fridges were possible. Now, all of this is partly because of newer technology, new ability to process teas, and the shifting of tastes that make these light, floral oolongs so popular. The advent of vacuum packing for teas means that even teas with high moisture content can be kept fresh for far longer than possible in the old days, so roasting becomes less necessary. The teas themselves also went through changes, with the leaves being rolled much more tightly than before due to the use of machines rather than hand, and stems now tend to be kept with the leaves (as you always see on gaoshan oolong) rather than clipped off the way they used to. All these changes are a result of technological innovations that took place since the 1970s, and allowed for the change in consumption pattern and preferences among the tea drinking public to take place. Of course, the people drinking the tea also changed this as well – it is much more attractive, for example, to drink a tea that is extremely fragrant. A fresh tasting oolong, whether it is gaoshan oolong from Taiwan or a spring pick tieguanyin from Fujian, tend to be very up front and immediate these days. They assault your senses, especially the nose, and they are very approachable. The fragrance lures people in, and is very popular with those who don’t drink tea very seriously. They are also easier to create – you can basically skip all the steps of roasting and re-roasting, which also means less cost for the farmer. Less work for more money? Sounds like a great deal. Consequently, the number of places that do proper roasted teas are slowly dwindling, and places that still use charcoal to roast are even less common. Some of that is due to cost and regulations – in Hong Kong, for example, it is pretty much impossible to charcoal roast anymore, because of both fire-code restrictions and also the cost of land and labour. In Taiwan such practices are still possible, whether in weird oven arrangements like I blogged about a few days ago, or oftentimes done in farmhouses up in the hills. However, in general, it’s hard, backbreaking work. In the summer the heat itself will kill you. 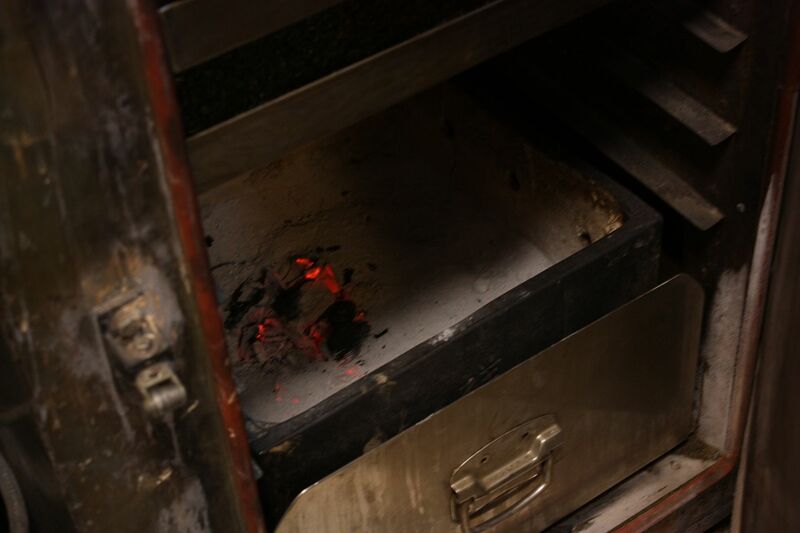 The few places that still do roasting in Hong Kong tend to use electric roasting techniques, which carry a slightly different fragrance and can taste a little metallic. For the most part though, such skills are dying. At the same time, recently there’s been a little bit of a revival in the taste of the consumers, with roasted teas seeing a little more press time and also interest than before. 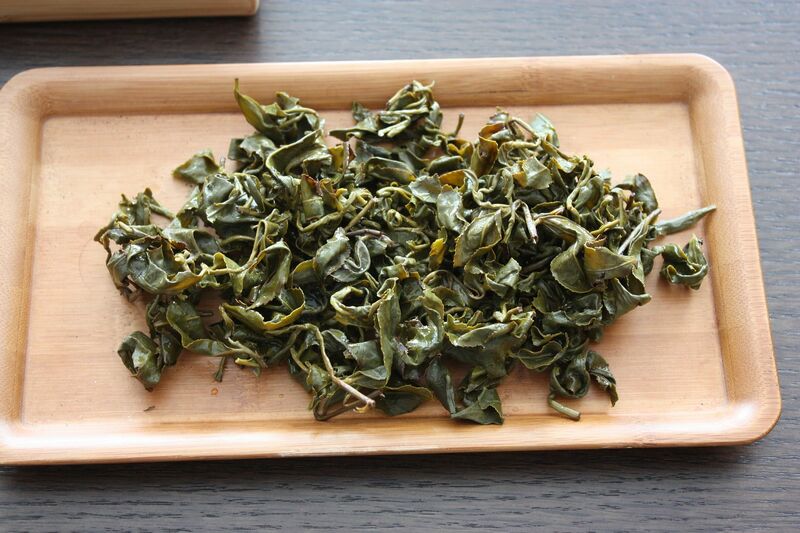 One of the things with the super-green type of oolong is that over the long run, they can be very harsh to drink. They are also, relatively speaking, rather boring – once you get past the first few infusions, the tea generally doesn’t hold much interest, and for those who are into tea, such single-dimensional taste can be quite boring. Roasted teas, on the other hand, can be much more soothing to drink and tend to have longer-lasting tastes. They are not quite an acquired taste like puerh, but are certainly less immediately alluring than floral oolongs. At the same time, they do tend to attract those who have spent some time with tea. One of the shops that I frequent in Hong Kong had some interview done recently in a local food and drink magazine, and since then, he said that business has picked up considerably. In the article, they talked about how roasted teas is their traditional method of making the teas, and that before the roasting is done it is not really considered a “finished product”. I can personally see this pickup in business, as more people come by buying tea that obviously look like they are coming for the first time. Even expats, who used to only buy things like jasmine and light, floral oolongs, are now opting for the darker stuff. The issue is that aside from some places, many such roasted teas are quite inferior in quality. Some cater to a very specific taste that might turn people off to this genre entirely, such as the pitch-black, carbonized shuixians that are mainly sold to Southeast Asia. There is, however, a balance between the two ends, and I think perhaps slowly but surely, the pendulum might swing back just enough so that the roasted teas once again see some popularity among the drinkers. After all, if there’s a market demand for this stuff, then there will be those who make them. I recently tried a somewhat roasted baozhong that is out of this world, but the price of such teas are also quite astounding. I suppose if the market will bear it, there will be those who will be willing to put in the work and effort to make such teas. Let’s hope it doesn’t disappear entirely, because the technique of roasting teas properly for drinking goes very far back in tea consumption history. Its loss will be a great one for all tea aficionados. I just came back from another trip to Taiwan, this time having a few days between work and tea hunting. Taiwan really is the island of teashops, and the kicker is, quite a few of them are very decent places, with good tea and run by good people. As one of my commenters mentioned, they don’t try to rip you off the way they do in the mainland. While MadameN and I were a little early to our dinner destination for a meeting with some colleagues from grad school, we decided to take a quick stroll around the restaurant and look at the amazing coffeeshops that are in the vicinity of the restaurant. While doing that, we ran into a tea store that looked as terrible as you can imagine – old, slightly broken and very dirty shelves, lined with bags of tea that have been stacked into pyramids, a common feature of many community teashops in Taipei. On the far end of the shop are bags and bags of teas, and some puerh cakes lining the wall. I decided to try my luck and walked in, asking if they have any aged tea. The woman who was in the store said she has to ask her dad, who really runs the operation, and ten minutes later, the dad walked into the store. I expected nothing when I walked in, since most of these stores have nothing other than reroasted-to-death “aged” oolong for sale. However, in the subsequent twenty minutes, which was all the time I had, he brought out about five different aged oolongs for me to taste, each one decent, some better than others. It was clear that my twenty minutes were not enough. I decided to go back the next day. So the next afternoon, after meeting up with Action Jackson, I went back to the store. We tried many teas. Aside from the rather obvious advantage of trying teas this way, which is that you can drink as much or as little as you want, while comparing them honestly without any interference with the brewing skills and parameters, it also allows you to literally throw away teas that are no good. What you’re seeing here is already after a few teas have been thrown out, with three young gaoshan oolongs, two aged oolongs, and one roasted one. More were tested before we stopped after having tasted a dozen or so teas. Whereas the exterior of the oven looks like, well, an oven for maybe baking bread, once you open it up you can see that the heat is actually being provided by charcoal at the bottom of the oven, with pans of teas being roasted above it. It’s actually not a bad idea – this way, he can do charcoal roasting while keeping the room’s temperature to a reasonable level, and also limits the amount of charcoal he needs to use as well as being able to roasted a relatively small batch at a time. To the left of the oven is where he rests his recently roasted tea, and to the right, with the big white bags, are aged oolongs of one kind or another – no vacuum pack, no jars, nothing, just plain bags with good aged teas that are surprisingly not bitter at all. Nor does he re-roast the tea, ever, because, as he himself correctly states, once you reroast an aged tea it loses the aged flavour. I heartily agree. In the end we all walked out of the store laden with tea, all sold at a very reasonable price. Having spent many days tea hunting in Taipei both on previous trips and this one, I can safely say that oftentimes the best shops for buying tea are also the ugliest looking, messiest, and dirtiest ones, with bags of teas piled everywhere, old, sometimes broken pots lining the shelves, and the most disorganized tea tables you’ve ever encountered. The shops that are neat, clean, with nice rows of boxed teas lit with mood lighting and packaged in designer bags are, more often than not, rather mediocre and rarely surprising. They might have a few things that are rare, interesting, or, better yet, sold with a story, but you have to pay a pretty penny for them, and I’m not sure if that’s worth the money, because what you can drink is the tea, and not the story. Being close to Taiwan is probably one of the biggest perks of being in Hong Kong, at least from the perspective of a tea lover. I count aged oolongs as the tea that I can drink day in, day out, and Taiwan is probably the best place to find such things. Even though MadameN and I only went there for three days this time, it did not disappoint. The Candy Store is of course my first stop, and I returned to find that the laobanniang still remembers me and that I was a seeker of aged oolongs. I spent a few hours sitting there, drinking tea and digging through big metal cans with her, and among the teas I tasted there were two or three that seemed quite decent. One, the last one I tried that day, was very similar to The One That Got Away, and I dare not make the same mistake twice. So I ended up taking home the whole bag of tea that she had, all 2kg of it. There were smaller successes too, as I went from shop to shop in Taipei looking for things. I replenished my supply of aged oolong, which, while not exactly running low, is low enough for me to have withheld consumption of aged oolongs for a while, opting instead to drink teas that are more readily available. Now, I am sitting in my office sipping an inexpensive aged tieguanyin that I bought on this trip that has the right mix of aged taste, sweetness, and throatiness. Yum. Having then punctuated the trip with a visit to the magnificent Taroko park, we returned to Taipei and picked up the tea I wanted. On the last day, before our departure, I met up with a dear tea friend from Japan who is both knowledgeable and incredibly generous, and together we visited a tea lover/maker/seller who brewed a series of quite interesting, younger puerhs, some of which are the best young puerh I have had in a while. That’s the other thing about Taiwan – in addition to lots of shops, it has a high number of people who are very keen on tea and who spend a lot of time thinking about it, drinking it, and in some cases, making it. Others are then attracted to Taiwan and visit, therefore further exchanging ideas and teas. It’s a very fertile environment in which to advance one’s own tea appreciation, and I can’t think of a better place for tea than that. With our bellies full of good tea, our tea companion took us to the airport and sent us off. Four days is far too short for a trip, but it was an invigorating one. I’ll be back for more, and soon. Tea wise, I’ve spent more time in old Hong Kong shops this trip than anywhere else. This time I was actively looking at various options for roasted teas — suixian, yancha, tieguanyin, and the like. It’s always interesting talking to these folks who run these stores, because each of them give you something new that you don’t know, and when you see where they have contradictions, you can then start figuring out what’s market-speak, and what’s truth. For example, I only found one shop that insists that they only do charcoal roast. In fact, the owner told me that “some charcoal just arrived — we’re going to start up the fires in a few days”. The others have all pretty much moved on to electric roasting, both because of space and cost, as well as, I suspect, the erosion of skill and the lack of people willing to spend two weeks in sweltering heat in a closed warehouse with lots of smouldering charcoal. I think it is indeed possible to taste the electric vs charcoal firing, having now tried a whole bunch of teas from different places, and I think it’s hard to say one’s definitely superior to the other. It is clear though that there is a lot more to roasting than just putting your tea over heat and hope for the best. Different people have mentioned the variations in temperature during the roasting of each tea needing to be refined so that you start and finish the right way. If you’re using charcoal, you also need to figure out when your tea is going in and coming out — apparently, different days of the charcoal have different characteristics, and the roaster needs to pay attention to that. All these are probably best left to the pros. They have decades of experience and know how to do it. One mentioned to me how, when he was transitioning from charcoal to electric, the first few electric roasts he did were terrible — the timing was all wrong, and the tea was burnt. The same happened when teas got tighter in their rolling – it became more difficult. Those people with lots of experience can quickly adapt. DIY roasting is, I think, best avoided. It seems almost frivolous to talk about tea when Japan has suffered one of the biggest earthquake in recorded history. I was on my way from LAX to Hong Kong while it happened, and when it struck I think I just got in the air, eventually flying through Tohoku, completely unaware that 35,000 ft below me was death and destruction on a scale that is hardly imaginable. Traveling with me was some teaware. I have virtually nothing here in Hong Kong to make tea with, and so I transported a few things so that it will be possible for me to host a few friends for some tea. It is always difficult to devise a course of teas for people who have varying levels of experience. In the group of five (not counting me) was one MadameN, a serious tea friend, and three relative novices. Left to our own devices, the serious tea friend and I will probably drink a parade of young and old puerh. MadameN normally humours my habit, to a reasonable limit. Then you have the novices, who may or may not react well to any or all of the teas, and it’s always a bit of a crapshoot because of that uncertainty. I settled on a menu of a green tieguanyin, a slightly aged baozhong, traditionally stored Guangyungong bits, and in the end, an impromptu Golden Needle White Lotus, courtesy of said tea friend. It is always fun to drink tea with people you’ve never done so before, especially if they’re encountering something for the first time, or have very little experience with what they’re drinking, because all of a sudden you hear all sorts of new perspective on the drink that you’re so familiar with, and end up learning more about it in the process. The green tieguanyin is the most familiar to all, I believe, and goes over as well as one would expect such things to do. The aged baozhong received mixed reviews, not least because the tea itself is odd — aged, but not too much so, and the liquor was a nice reddish colour. It is slightly sour, with that vaguely chemical smell that sometimes accompanies aged oolongs. It was likened to paint thinners as well as meicai (preserved Chinese vegetables), which is quite apt, I think. The Guangyungong bits elicited some interesting comments, ranging from a certain hollowness, to varying responses on the bitter/sweet balance in the tea, and the earthiness of the brew. Some were very attuned to the aftertaste that both the baozhong and the GYG present, while others were less aware of their existence. What I always find most interesting though is that what tea drinkers see as good tea is often not necessarily considered good by others. Sometimes there’s a lot of navel gazing when tea drinkers talk to each other about teas, and forget that for most people, none of the teas we drink are actually good (i.e. taste good, in a juicy, flavourful way), but perhaps merely interesting. The Golden Needle White Lotus, for example, does well up front, but when stressed to a slightly longer (1.5 minutes) steep alongside the GYG, it’s obvious that the GYG is sweeter and better. What’s most important though is that everyone had, I think, a good time. Tea is best drunk with friends, and if I could, I would do this every day. Although the natural environment in which teas grow obviously affect how they taste, processing, for oolongs at least, is king. The sheer number of variables is astounding, and the range of tastes that are possible, from the really light and floral baozhongs to the really dark and heavy wuyis are what make oolongs so much fun (and why so many people drink them). I’ll try to proceed in the order in which these things happen in the production process: oxidation, rolling, roasting, aging. Oxidation is the first step in oolong production that makes it distinct from green teas, and it really happens immediately after the tea leaves are plucked. When leaves get harvested, they usually go through a withering stage, and then they are bruised so that the cell structure breaks down, so that the enzymes can get to work and oxidation can begin. How much bruising, how much time for oxidation, under what conditions, etc, are the kinds of things that create particular flavours in a tea and are also the domain of a master tea maker. I suspect, for example, that darjeeling oolongs have generally turned out to be similar to their first flush is because they haven’t quite gotten the hang of the oxidation process yet, so everything still taste sort of vaguely similar. I have talked to folks who tell me that they have to control for everything from weather, to time of day, to moisture level in the air, etc, and they know when to stop the oxidation process and start the kill-green by the way the leaves look and smell. That’s stuff that I think I will only be able to learn if I become a tea farmer and work on it for thirty years. The kill-green stops the oxidation process, and then you have to roll the tea — literally rolling them in the old days, in cloth bags with the farmer’s feet doing the rolling. These days, that’s more often than not done with a rolling machine. The purpose of rolling here is more or less like the purpose of rolling for puerh — squeezing out liquids, and basically allowing a lot of the dissolvable materials to stick on the surface of the leaves rather than remaining inside. The rolling process can take a while, and depending on the area in which this is happening, rolling will also determine, to a large extent, the final shape in which the tea takes. Just look at any dancong and compare it to a Taiwanese gaoshan oolong and you’ll know what I mean. The drying and roasting process is then the step in which tea becomes tea — drinkable, brewable leaves. This can be done in different ways, but generally speaking, this is mostly done through machines again. At what temperature and for how long is really a matter of the craft of the teamaker again, because the retained moisture at the end of this process affects how the tea will taste by the time it gets to you. Even though leaves look dry, there’s always some moisture in them, and the amount of drying/roasting that it goes through affects this value, which then changes the way it keeps and the way it ages through time. That’s why, for example, vacuum sealed packs of somewhat wet leaves don’t keep too long and need to be left alone in the fridge — they go bad, fast. Generally speaking, the drier the leaves, the longer/better they keep. Roasting is a process through which moisture gets taken out of the leaves, and re-roasting, which was done often, was something that tea merchants would routinely do themselves in order to refresh a stock of leaves — reigniting (and changing) the aromas of a tea, and to take out excess moisture that usually ends up imparting a sour flavour on the leaves. Oolongs can go from virtually no roasting to really heavy, pitch black roasting, and the skill of the roaster in handling this again has a direct and immediate effect on the way the teas come out. There is also a regional preference here, with Wuyi teas generally being of higher roast, for example, and modern day tieguanyin from the mainland are increasingly little to no roast — nuclear green, in other words, which I personally find terrible to drink. There’s literally something for everyone here, depending on one’s likes and dislikes. Then there’s the question of aging, which I have written plenty about before. I don’t think all oolongs will age well — only a select few do. Badly aged oolongs are usually sour and pretty disgusting, and sometimes re-roasting them will fix the problem. However, there are lots of fake aged oolongs out there that are simply heavily roasted teas pretending to be aged teas. They can be nice, but they’re not necessarily very old. I personally find aged teas to be most fascinating, and since I don’t drink nearly as fast as I buy tea, I end up having some teas that I age myself without really having intended to do so — such as the cup of 2006 Beidou that I’m drinking right now. Over time, a properly aged oolong should have a reddish appearance in both the leaves and especially the liquor, and the taste should be sweet and aromatic. Then they eventually acquire the type of taste that all aged teas get — hard to explain, but you know one when you see one. The interesting thing here is that the permutations of various factors – location, processing, aging – combine to form all types of flavours and aromas that you can get from oolongs. I can safely say that almost no two oolongs are the same, and every time I go to a store in China that specialize in some type of oolong or another, each batch that I try are going to be different in some way or another. Because so much of it also depends on post-processing and storage, even after the same batch of tea left the factory, the ultimate result in your cup may still differ. I suppose that’s what makes it fun. Of all the families of teas out there, oolongs are probably by far the most versatile and varied in appearance, aroma, and taste. Situated between green and black, oolongs, by definition, are semi-oxidized teas that can be almost as green as green teas (very light baozhongs come to mind) or very dark, almost black tea like (oriental beauty). By virtue of the variations possible, oolongs are complex and interesting teas that often bear little resemblance to each other, but offer the drinkers a wide range of possibilities. Making sense of all this can be difficult; I’m going to try to at least systematically lay out what these various issues are, and what I have learned so far. 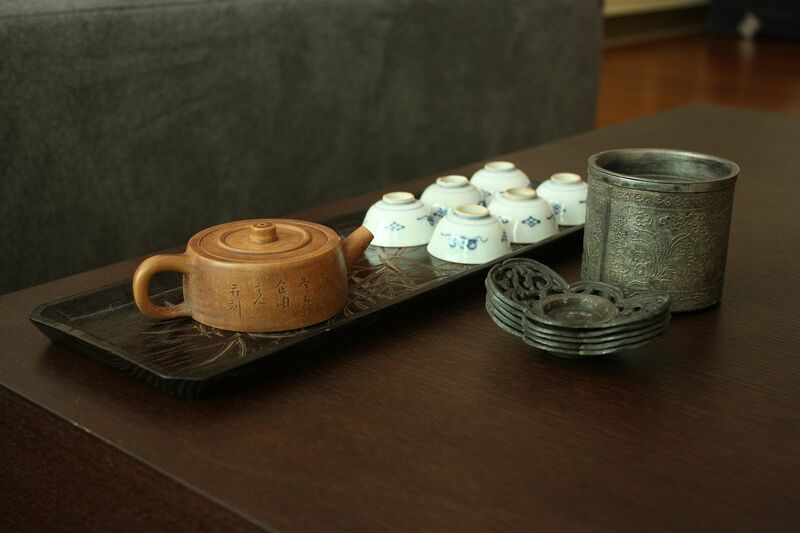 There are I think three different factors that go into the growth of oolongs that we, as consumers, need to consider. Those are, in no particular order, terroir, varietal, and season. Then, in the processing from raw leaf to the finish product, there are additional variables that a tea farmer/maker can manipulate to change how the tea comes out, and those variables can include oxidation, rolling, roasting, and in some cases, aging. I’m going to just try to talk about the first set of things and worry about the second set later. When dealing with terroir, to borrow a wine term, we are really talking about the soil, climate, and other environmental factors that go into the growth of the tea, which in this case would also include altitude. I think we can talk roughly about large geographic areas, but also small microclimates. 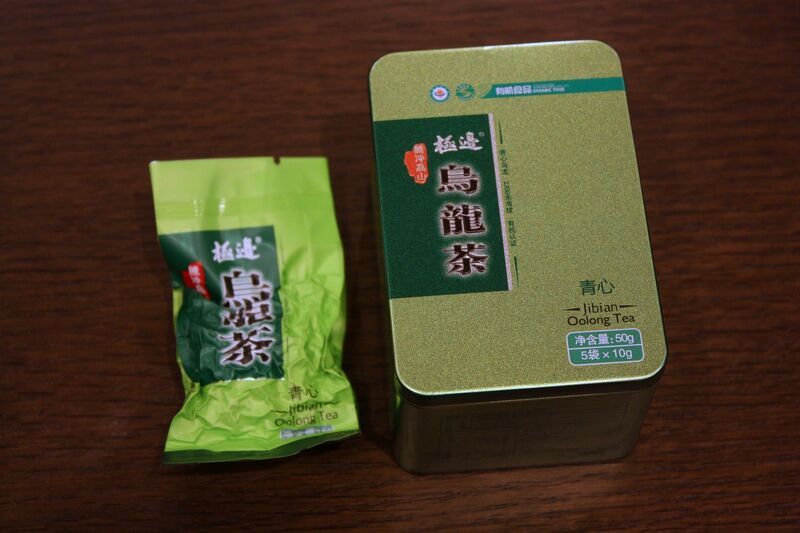 For example, teas from Taiwan tend to share a similar set of taste profiles, especially in the aftertaste of the tea. They could be from different varietals, using different techniques, and grown in different areas of Taiwan, but many Taiwanese teas end up tasting similar in some fashion, and are often easily identifiable as Taiwanese. Likewise, Wuyi yancha can (and to many, should) have a similar taste, especially that fabled yanyun, which roughly translates into “rock aftertaste”. Even when Taiwanese tea farmers make teas using Wuyi varietal and methods, they can’t achieve the same results. That’s terroir for you. Location matters though, so whether or not the tea you’re having is from a hilly slope or flat ground, high up or down low, moist or dry, well lit or not, and shaded or otherwise all have to do with how the tea comes out in the end. So while we can talk about large swathes of land when discussing tea, we can also talk about smaller areas. Anxi tieguanyin costs more than teas from nearby counties, and not all Dongding teas are created equal, as anyone who’s tried a number of them can tell you. Things like that are hard to control, and often for the end buyer, relatively meaningless, because we rarely know exactly which farm a particular tea came from. When we can find out, however, it often tells you something about what you’re drinking, and accumulating experiences in telling apart various kinds of growing conditions is a true mark of a tea expert. Varietals obviously also play a role here, and the most famous of these is perhaps tieguanyin and all its imitators. 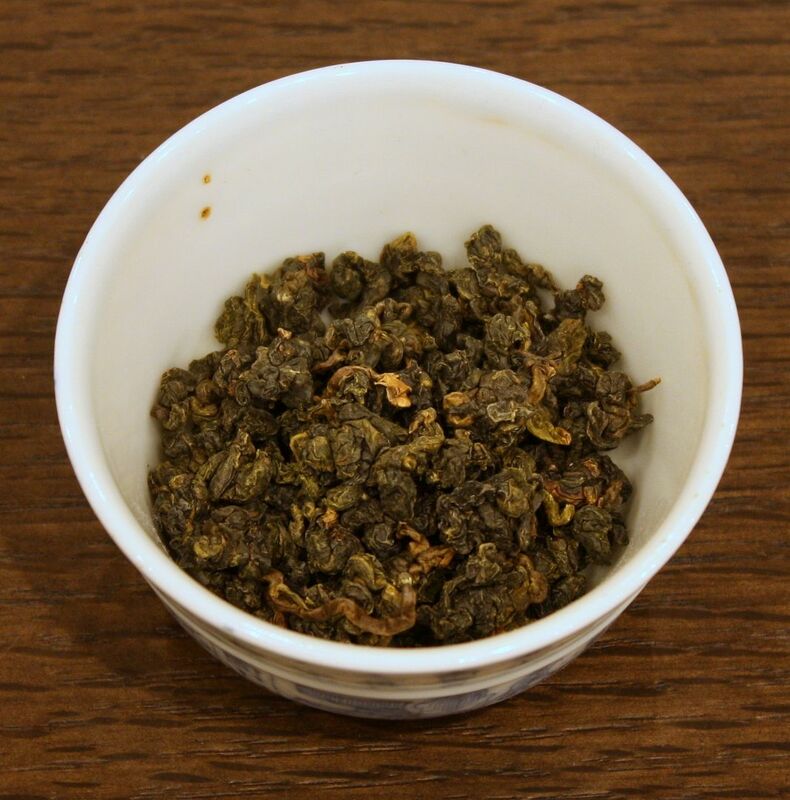 A maoxie or huangjingui might look and taste somewhat like a tieguanyin, but it never is one, and those who drink a lot of tieguanyin can generally tell you right away if the stuff is real or not. Likewise, we all know the story of the original dahongpao, and all the generations that the originals have spawned. Varietal matters, and also changes the way the tea taste in a fundamental way. Unlike terroir, for the consumer, varietal is difficult; it requires a great deal of experience to be able to tell apart different kinds of oolong trees and their leaves. Whether that is a jinxuan or a siji or a ruanzi or a taicha #18, is not something that a tea novice can do easily. If you don’t drink it often, chances are you are entirely at the mercy of the vendor, who is often at the mercy of the maker. I think this is why finding reliable and trustworthy vendors is so important — not only that you can trust them to not lie to you, but you need to be able to rely on the vendors to do the due diligence and basically fact check the maker of the tea. There are many out there who merely parrot the story told to them when they bought the tea — that’s sometimes a recipe for disaster. The season in which the tea is picked is the final big variable for those of us trying to drink oolong. A spring tea is inevitably different from a fall tea, and mostly on Taiwan, you often see a winter crop as well that is yet again different. In my personal experience, spring teas tend to be floral while fall teas often have more body, and winter teas have a unique fragrance and sweetness that is quite distinctive. You rarely see anyone advertising summer tea, and there’s a good reason for it — slower growing tea tend to be better tea, and summer is usually when the tree undergoes a growth spurt, leaving relatively thin and uninteresting leaves for you to consume. Already, we’re dealing with a dizzying array of possibilities that can significantly impact the teas we drink. Puerh-heads spend a lot of time worrying about these issues all the time — where the tea’s from, what season it’s picked in, etc, but oolong drinkers tend to obsess a little less about these. I think a big reason for this is simple: the lack of clear and obvious ways to tell different sorts of teas apart, and the importance of post-processing that creates the final tea. Those are serious mitigating factors to everything I’ve just talked about, and can change the tea in drastic ways. Not having an easy way to tell apart different kinds of teas sold under different names is obviously a difficult issue as well. Just witness the number of teas out there that are advertised as tieguanyin or dahongpao — surely, they can’t be making that much of these teas. Something obviously has to give, which means that there is a fair amount of false advertising out there. Since it is virtually impossible for the regular consumer to compare two of the same sorts of teas from two vendors easily, it is all the more important to at least educate ourselves with regards to what may be out there, and in doing so, become a more discerning drinker.